Silver Dollar City’s Festival of Wonder is going on now! Guests will experience incredible shows, delicious dining options, and thrilling rides! Albert Lucas: Experience world-renowned juggler, comedian, variety artist and world record-holder. Guests will enjoy this amazing one-man show! 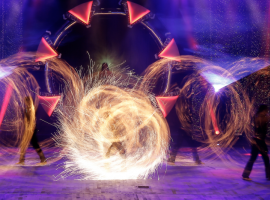 Cirqunique: Featuring new acts this year, this electrifying production features the most unique, unusual and talented artists to be found in a single show. Phoenix Fire: Phoenix Fire has over 20 years of experience and is regarded as the originators of LED, laser and light performance with pixel programming, black lights, projection mapping and interactive visuals. This multimedia experience will feature lasers, special effects and even fire. Craving delicious food? During the festival guests can try unique foods such as: fortune cookie waffle cones, meat lovers nachos, a variety of waffle fries, po’boys and calzone sandwiches, and build-your-own Ramen bowls. Guests will also enjoy all of the rides that Silver Dollar City is known for like: Time Traveler, Outlaw Run, Powderkeg, Thunderation, and many more. Be sure to catch this amazing festival before it ends on April 28!